Brendan’s no ordinary burger lover. His single-minded pursuit for locating the best burger joints around the world led him to start an online venture, which he naturally named as BrilliantBurger. The main aim of BrilliantBurger is to connect all burger lovers and help them find out which joint in their locality offers the best burger. This required creation of an online portal, a mobile app and lots and lots of burger lovers. Credencys provided IT consulting, engineering and design expertise in building this mobile app. 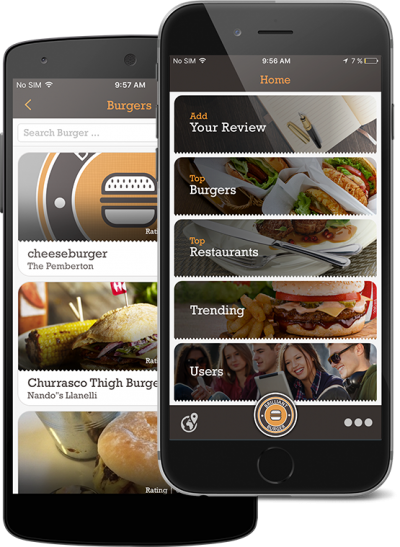 The burger portal allows customers to view, manage and search favorite restaurants or burgers. They can also see which burgers are trending, add favorite burgers (and restaurants) for others to see, they can review, they can read reviews, they can see their friend’s experiences and they can search different burger joints. All this is available with future-thinking technology that allows for expansion of future locations and more wide spread use as it grows. Retailers can use analytic results as a reporting and marketing tool as well to see what consumers like most. Many have downloaded the app already. The web-based dashboard allows them to engage with fans and make personal connections while introducing their product to new people. Customers benefit from the experience of one platform for all burger lovers. Using GPS, they can find the best burger and top burger joints near their current location – when they want it, where they want it. And the crowds all cheered “Huzzah”!